I'm a big fan of pocket carry. One of its most endearing benefits is that it allows me to carry in locations where I would not be able to go with a gun in a belt or shoulder holster. Because the gun is hidden in a pocket, I don't need a jacket or vest for concealment, which is great for locations where such clothing would not be appropriate. This Mitch Rosen holster uses a felt panel to disguise the gun's shape and a plastic tab designed to hook on the pocket during the draw. On the draw, the hook grabs the edge of the pocket to release its hold on the gun. Just pull the gun toward the center of the pants and lift straight up. Wearing a suit at work where others are dressed casual would certainly look odd. I especially enjoy not wearing a concealment garment in hot weather, and I like the ability to wear a T-shirt and shorts and still have my gun--all without anyone being the wiser. If you're licensed to carry a concealed handgun, you might want to give consideration to this method. You might find it difficult to believe that pocket carry offers a very fast draw if you haven't tried it yourself. The secret lies in the ability to have your hand in your pocket with a complete grip on the gun without anyone knowing it. Cutting out half of the steps required makes the draw lightning-fast. A hand in the pocket is a very normal and nonconfrontational position and won't alarm anyone. I often walk down the street or hang out with my hands in my pocket, and no one blinks an eye. Even if you don't start with your hand in your pocket, draw time can be just as fast as a regular holster with practice. Another benefit of pocket carry, and one that is not often thought of, is that it is unlikely that someone could detect a gun in a pocket by casual contact, such as bumping into you or by giving you a hug. Even if he feels it, no one will guess that the bulge is a gun because most people are not accustomed to thinking about guns in pockets. The outline of the gun is easy to see on the back side of the Kramer holster, but the Kydex panel on the front handily eliminates the recognizable shape. For most people, the only way to carry a gun is on a belt or stuffed inside the waistband, like they see in the movies. An encounter with an old friend or visit from a relative with a gun on your belt could get you raised eyebrows after a friendly embrace. While an acquaintance or relative may not mind, it is probably not a good idea for others to discover that you carry. In the winter, with your heavy coat zipped up and gloves on, getting to your gun fast can be a problem. While leaving your coat open and hands exposed may work on short outdoor excursions, colder weather may find you bundled up tight. That's where a revolver in your winter-coat pocket can be a real life-saver. Not only can it be easily accessed--your hand can be right on the gun in your pocket--you can shoot right through your coat for an instant defense. Not needing a concealment garment means that you don't have to worry about exposing your gun when you reach up or bend over. It's so easy and fast to just slip a gun in your pocket that it's more likely that you will actually carry. Those quick trips to the Stop 'n' Rob seem like a drag when you think about donning your leather, but slipping a gun into your pocket is as natural as grabbing your keys. This Kydex pocket holster by Fist is designed for the shooter to push the holster down with the thumb during the draw. I started carrying in my pants pocket about 10 years ago when I got a shirt-and-tie office job. Previously, either working for myself or as an independent representative, my clothing and carry habits were not scrutinized by a legion of higher-ups. While the new office job certainly did not have a prohibition against suit jackets or sport coats, it would have been out of place with the casual atmosphere, not to mention uncomfortably hot in the windowless, stuffy environment. Picking a gun for pocket carry took some consideration and testing. In my younger years I had often carried a Seecamp .32, but those days were gone--a .38 or 9mm was my minimum. Having a choice, I don't want to fight a fire with an extinguisher the size of a can of spray paint, and I don't want to use a small gun in a big fight. I wanted a fighting caliber if I ever found myself in the unlucky circumstance of having to defend myself. I quickly found that the increased size and weight of the bigger gun created its own challenges. The first few months of my new job saw lots of on-the-job training, not only business but also the business of pocket carry. The common adage of carrying a firearm is that you need to dress around your gun. It is just as true with pocket carry as with belt carry. The number-one issue is wearing the right kind of pants. For me, pleated pants offer the best concealment and ease of draw. I know lots of folks who pocket carry in jeans, but I just can't seem to wiggle my hand into the tight pocket or get the gun out fast. When shopping for clothing, the important thing to look for in pants is to find ones with the correct-size pocket openings. If the opening is too small you won't be able to get the gun out easily. With my hand size and gun that I carry, I find that I need a minimum of six-inch pocket openings to work well. When shopping, I carry a strip of paper with me cut to the six-inch length to help me pick out which pants will work. Finding pants with wide openings can be a daunting task because most pants won't work. Don't get discouraged. Keep shopping; they are out there. In addition to the width of the pocket opening, you also need to make sure the pocket depth is deep enough to conceal the gun. However, don't worry about that when choosing your clothes because a tailor can easily extend the pocket length. gun will rotate and flip; it helps keep pocket lint out of the gun's action; and, very important, it breaks up the outline so it does not "print" like a gun in your pocket. When you are walking and sitting, a pocket gun will most likely bulge, but if the holster is doing its job it will look more like a wallet, not a gun. It's like I said previously: People are not accustomed to thinking about guns in pockets, so they don't look for them or suspect that pocket bulges are guns. With all the pagers, cell phones, PDAs and MP3 players out there, bulges have become common. I have pocket-carried for more than 10 years in very anti-gun environments without anyone ever noticing. This image of a Ruger SP101 over the Kahr shows the difference in the rear end of the guns. The author finds the smooth angle of revolvers works better for pocket carry. When selecting a holster, look for one that has a flat outer-facing panel to break up the outline of the gun. Mitch Rosen Extraordinary Gunleather's PSF has a suede pad front panel, while Kramer Handgun Leather's design uses a piece of Kydex to flatten the bulge. Galco has two Pocket Protector models, one made of steer hide and the other of premium horsehide. On the less expensive side, many holster companies such as Uncle Mike's, Desantis and Safariland, just to name a few, offer simple pocket holsters as well. When choosing a holster, one of the first things to do is decide how you want to draw. Disengaging the gun from the holster can be done in three ways. 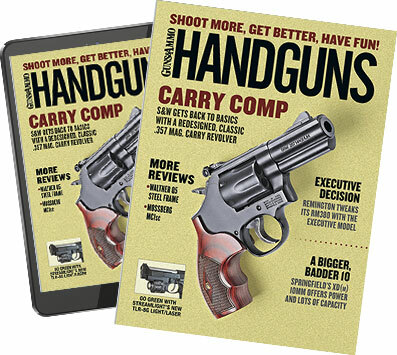 While the holster is in your pocket, push it down with your thumb while drawing the gun upward. You can also hook the holster to your pocket opening as you draw. Additionally, the holster fits the gun loosely and stays in your pocket during the draw by friction. While some people extol the virtues of loose-fitting holsters that stay in the pocket by friction, I have not had much luck with them. You only need to have the holster come out with the gun once at the wrong time to have a big problem. I prefer the proactive approach of removing the holster from the gun myself. If you decide to use the "hook method," make sure there is a place on the holster that is designed to be hooked. Same with the "push off" concept. Both are good solutions, but both, as with all things, take some practice to master. No matter which method you choose, make sure the holster is not so loose that the gun can easily fall out by itself. I've heard all too many stories of someone standing up from a nice, comfy couch only to find the gun laying on the seat. Filling your pocket with a gun reduces the number of pockets you have for other things. If you generally have personal items in all of your pockets, you need to find a new home for some. I used to carry my keys and change in the pocket that I now use for carry. Coins now reside in a rear pocket because it's a very bad idea to put anything in your pocket that may impede your draw. A few poorly placed coins can easily jam your gun into your holster. Having run out of pockets, I now have a Kubaton on my keyring, the sole purpose of which is to carry my keys hooked in the waist of my pants. Another option would be to hook your keys to your belt loops. "No draw" is the fastest draw possible. A shrouded or internal-hammered revolver offers unfettered shoot-through capability. Once I graduated from the Seecamp, my preferred carry was a Smith & Wesson Model 340 lightweight J-frame revolver. After carrying that for a few months, I changed to the Kahr P40 for the increased capacity. I ended up going back to the revolver for two reasons. First of all, revolvers are less sensitive to dirt than semiautomatics, and I discovered that pocket carry, even with a holster, does involve a lot of pocket dust and lint. Second, I find the shape of revolvers makes drawing easier. Small autos have a square-edged slide that I find gets caught as I am trying to draw. The shape of revolvers is angled and makes drawing easier. I prefer a revolver with a spurless or internal hammer to make drawing easy. If your revolver has a spur hammer, you can still use it for pocket carry, but you have to remember to cover the spur with your thumb to keep it from getting caught. If you want to be able to shoot through your pocket, a hammerless or shrouded hammer will allow you to fire the entire cylinder without jamming. With an exposed hammer, it is possible to get fabric caught between the hammer and firing pin, which can keep the gun from firing. Like everything else, pocket carry does have its disadvantages. The biggest drawback of pocket carry is that the draw is slow if you're sitting down, especially so when seat-belted in your car. The only way to get around it is to practice leaning forward and drawing when seated and also practice releasing your seatbelt before drawing. Last, your 14-round, custom-built, ported superauto just won't fit in your pocket. You are limited to what will reasonably fit in your pocket. While physical size may be restricted, you don't have to be limited in power. Pocket carry is not just for micro guns. With the right pants and pocket holster, you can easily carry a J-frame-size gun. I started my pocket carry with a little Seecamp, then I moved up to a lightweight J-frame. from a semiauto, I wanted an even more powerful round than .38 Special. Interested in carrying my all-steel Ruger .357 Magnum SP101, I was afraid that it was just too heavy. I experimented with it and found that as long as my belt was tight enough to support the pants, the extra weight was not a problem. As a test, I carried the SP101 in one pocket and the lightweight J-frame in the other and found almost no difference in comfort despite the differences in weight. Whether for a primary gun, backup gun or winter gun solution, take a look at pocket carry. With a little experimentation and practice I think you will find that it's quite a handy carry method. David Kenik is the author of Armed Response: A Comprehensive Guide to Using Firearms for Self-Defense, president of the Police Officers Safety Association Inc. and an armed citizen.